The TQC Grindometers or Fineness of Grind Gauges are precision instruments to determine particle size and fineness of many materials like paints, lacquers, pigments, filler, chocolate etc.. Most TQC Grindometers have double grooves with graded slopes graduated in three different parameters: µm (microns), NS (Hegman) and PCU (North). 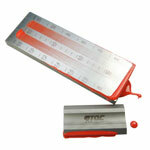 Gauge and beveled scraper are made of hardened stainless steel and have an accuracy of 2 µm. The scraper: 75x38x8mm shaped to be hold easily. Klik tombol di bawah untuk menambahkan Grindometer Fineness Of Grind Gauges ke Daftar Keinginan Anda.